Meat, glorious meat - it’s a backbone of our culture. Kiwi lives are built on a hearty foundation of meat and three-veg dinners, after-match sausage sizzles, and the ever-sacred tradition of Friday night fish and chips. 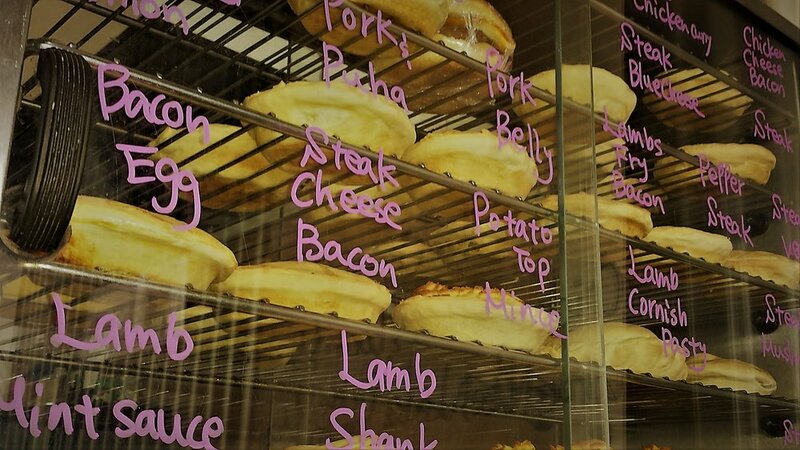 In fact, google ‘meat pie’ and Wikipedia will tell you the fatty treat forms “part of New Zealand’s national identity”, while theculturetrip.com describes it as “the cornerstone of our culinary cuisine”. Dr. Rosie Bosworth, self-declared food futurist, and owner of a developing plant-based milk company, thinks it is. Speaking with Jamie McKay on The Country two weeks ago, Dr. Bosworth shared an opinion that is beginning to gain traction, not just in New Zealand, but across the Western world – that we are heading for a future without meat, in fact, without animal-sourced food products at all. You’re likely to have heard this theory espoused quite frequently in the past eighteen months. Phillip Mathews, writing for Stuff in July of this year, urged the government to ‘wake up and smell the meatless future’, and the launch of Air New Zealand’s notorious ‘impossible burger’ that same month raised a furore over the potentially damaging effects of future movements toward plant-based and synthetic animal products on the farming sector. Overseas, alternative meats have seen some big-time celebrity endorsements lately, with Richard Branson, Bill Gates and Leonardo DiCaprio investing a combined 100 million+ dollars in several ‘clean meat’ companies, and Branson predicting the end of meat in just thirty years. Well, first, there’s the environmental factor. A recent study has estimated that, should meat production continue at its current rate, by 2030 it will be producing 1.9 billion tonnes of greenhouse gas emissions annually. With the threat of global warming knocking on the door, finding ways to limit the production and consumption of meat - and therefore reduce these emissions - has rightly become a top concern. Animal welfare, too, has played a part. In the last decade, concern over the treatment of livestock has increased dramatically, a trend reflected in films like Cowspiracy, Food Inc., Forks over Knives and Food Choices. As a result, veganism and vegetarianism have seen a huge surge in popularity, boosted by social media, and celebrity endorsements. But are these developments enough to suggest the meat industry may soon be facing total extinction? Might we be heading for a future where animals exist only as pets and co-inhabitants of the earth, rather than a significant source of food? Let’s see what the science and statistics have to say. Statistics compiled by oecd.org tell us that, in New Zealand, overall meat consumption has indeed been on the decline. Between 2007 and 2017, the total consumption of meat per person per year in this country decreased by 12.9 kilos (93.1 to 80.2). However, that decrease isn’t across the board. Poultry consumption has risen from 30.4 kilos per person in 2007 to 37.9 in 2017. Pork consumption too has risen in that time, though by a less dramatic two kilograms. The big consumption drops come from beef and lamb. Beef consumption has fallen by 7.1 kg since 2007, while lamb, incredibly, dropped from 18.5 kilograms to a mere 3.2. The question is: what has caused this decline? Compare that to chicken prices, which this year fell to their lowest level in a decade, and it’s easy to see why poultry has become the meat of choice for so many kiwi consumers lately. Price aside, multiculturalism and a change in the kiwi attitude towards fresh chicken have had a huge impact in our meat consumption trends over the last twenty years. The influence of international culinary habits has seen many New Zealander’s gravitate away from what was once a meat-heavy national diet. Exposure to a variety of global cuisines has seen us transition from the traditional meat and three veg, long-cooking dishes to quicker, easier meals that suit an increasingly active lifestyle. “These days”, says Hickford, “people want to be able to cook up a dinner quickly - throw diced meat into a hot pan and fry it up. That’s why as a nation we’ve gravitated toward pork and especially chicken, because it’s quick and easy to do, and very versatile. Owing to multiculturalism, people are eating far more stir-fries, curries, chicken salads, things that are quick and easy to do and that can be reheated and eaten later in the week to keep up with a busy schedule. We haven’t really adapted our cooking style to favour the slow cooker, which favours the likes of lamb and beef. “The poultry industry has been clever to produce millions more chickens in a range of useful cuts. Thirty years ago, we didn't really do much stir-frying, but now many of us do. You can buy chicken thigh and chicken breast, slice them thinly and toss them into the pan with the vegetables”. Representative of this shift, consumption of fresh chickens has gone through the roof in the last few decades, with a staggering 96 million fresh chickens processed in New Zealand last year, up from the 11 million processed in 1981. Breasts, cutlets, thighs, wings - kiwi consumers are given endless options when it comes to fresh chicken cuts, allowing for diverse, quick and easy meal options. The combination of these two factors - foreign-influenced dietary changes and a production change in the poultry industry – has undeniably influenced the kiwi consumer’s turn away from meat-heavy meals. That’s a turn, mind you, toward a more balanced diet, favouring less meat rather than none at all. It’s important to acknowledge that New Zealand’s above-mentioned dietary shift has only been possible, in large part, because we have the economic affluence and food-availability to facilitate it. The recent rise in vegetarianism, veganism, and the production of alternative-meat products has caused many to proclaim a ‘worldwide’ shift in dietary habits, but in reality, that shift is confined mostly to parts of the developed world. Erik Matthijs highlights this in “Exploring future patterns of meat consumption” (2015) where he notes that “reduced meat consumption is taking place only in a limited set of high-income countries”. This is reflected in a “meat supply per person map” provided by ourworldindata.org, which shows the biggest decrease (2003-2013) in per capita meat supply in the following countries: New Zealand (< 6Kg), Canada (< 9Kg), France (< 7Kg), Ireland (< 14Kg), Italy (< 2Kg), and the UK (< 3Kg). These countries have all seen a dramatic increase in veganism and vegetarianism since the turn of the century. Why? Because they can afford to do so. In places where food is scarce, however, and economic comfortability is afforded to few, dietary picking-and-choosing isn’t really an option, and meat stands as a highly valued, vital source of nutrition. The nutritional vitality of meat in developing countries cannot be understated. Professor of Community Health Sciences and Paediatrics Charlotte Neumann wrote about this extensively in 2004. “In developing countries”, she said, “approximately 183 million children are underweight-for-age, 67 million are underweight-for-height (wasted), and 226 million are low height-for-age (stunted). This infantile malnutrition is characterised by skin lesions, muscle wasting and extreme apathy, the products of a starchy, protein-poor diet. Eliminate meat and you remove one of the primary sources of protein in the developing world, which as it stands is already scarce. New Zealand-based statistics might support Dr. Bosworth’s notion of a decline in meat popularity, but as suggested above, worldwide trends tell a different story. Between 2007 and 2017, total meat consumption increased by 1.6 kilograms per capita (68.2 kg – 69.8kg) in the OECD and just under 3 kilograms per capita worldwide (31.5 kg – 34.4 kg). Again, poultry accounts for most of this rise, with a 3.8 kilo per capita rise in the OECD and a 2.1 kilo per capita rise worldwide. In that time, Beef and veal consumption has decreased by 1.4 kg in the OECD and stayed at virtually the same level worldwide. It must be noted that the above statistics, provided by oecd.org, include consumption of beef, veal, poultry, pork and lamb only. Statistics for the consumption of all meat types worldwide are not yet available for the years 2014-2017. 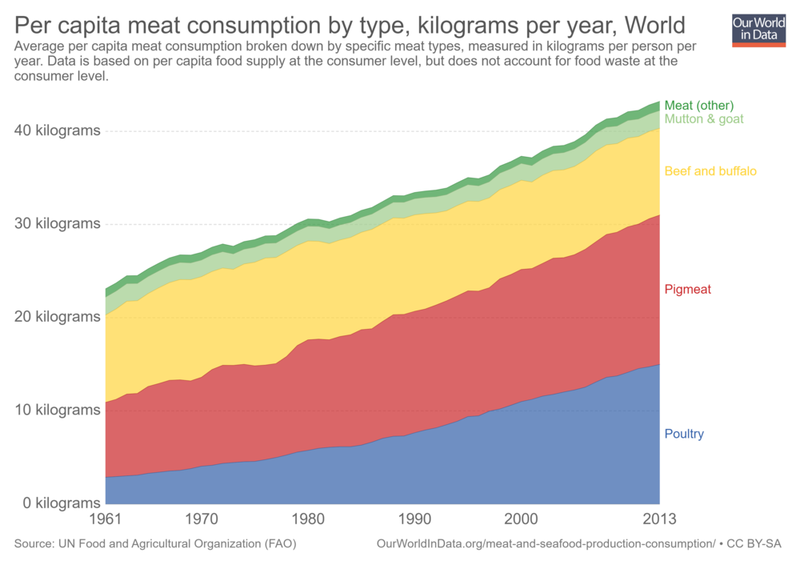 Our World in Data provide total global meat consumption (including buffalo, mutton and ‘other’) statistics for the years 1961-2013. Their data shows total global meat consumption of all types to have grown at a slow but steady rate over this period (0.38 kilograms per capita per year). Again, this shows that, although meat consumption is down in a handful of developed countries, the worldwide trend is still up. A report produced recently by OECD entitled, “OECD-FAO AGRICULTURAL OUTLOOK 2018-2027”, predicts that this will continue to gradually increase over the next decade, with worldwide consumption reaching 35.4 kg per person per capita in 2027. Hardly the ‘meatless’ future many are prophesising. Much has been said about the benefits of reducing meat consumption lately, and it has become clear that doing so, particularly in the developed world, is achievable, and would be hugely beneficial. But what if we removed meat from the equation altogether, as some suggest we will within thirty years? In a 2016 article for BBC Future, Rachel Nuwer asked this very question. Referring to studies conducted by food and agriculture experts Andre Jarvis, Tim Benton, and Marco Springman, she spoke first of the obvious benefits: huge emissions reductions, the restoration of grasslands and forests, improvements in biodiversity, etc. Scientists have discussed these positive effects for a time now, they can’t be denied. However, Nuwer also investigated the downsides to going (excuse the pun) ‘cold-turkey’. “Around one-third of the world’s land is composed of arid and semi-arid rangeland that can only support animal agriculture. There would also be a nutritional fallout in the wake of a complete removal of meat from the global diet. The report affirms that the ability of livestock animals to convert energy-dense, micronutrient-poor crops (e.g. grains) into more micronutrient-dense foods like meat milk and eggs is vital and makes them irreplaceable. So, if getting rid of livestock, and therefore animal products, isn’t the answer, then what is? The key point of Nuwer’s article is moderation. For example, a study published in Climatic Change found that simply adhering to the World Health Organization’s dietary recommendations would reduce the UK’s greenhouse gas emissions by 17% – a figure that would drop by an additional 40% should citizens further avoid animal products and processed snacks. Nuwer notes that simple, almost unnoticeable dietary changes could account for these reductions. Corrina Tucker’s “Using environmental imperatives to reduce meat consumption: perspectives from New Zealand” discusses this need to find a balance through what has been termed ‘flexitarianism’ – “a mode of eating whereby meat consumption is purposely reduced but not eliminated”. The piece suggests reducing meat consumption in developed countries, where it is often three to four times higher than in developing countries, is the key to addressing the current climatological and ecological concerns. There’s no reason to suggest a substantial reduction wouldn’t be achievable. As I’ve said, several nations, including our own, have begun to take steps in that direction, with the driving factor being basic dietary changes, made all the easier by the diverse range of alternative-meat products becoming available. Earlier this week I interviewed George Mander, who spoke of the incredible benefits of reducing global meat consumption through the introduction of nutrient-enriched insects to the conventional diet. If creepy crawlies are a bit much right now, consumers can look to more conventional plant-based meat substitutes, or vegetables and legumes like chickpeas, tofu, lentils, mushrooms, and spinach, which, combined with smaller portions of meat, can provide the same meal benefits in terms of taste and nutrition. Again, the idea here isn’t to eliminate meat entirely, but rather to offer up supplementary sources of iron and protein which can (in countries where they are affordable and available) cut steak, chicken, lamb or pork portions down to the recommended 80 or 90 grams. Just that small change could make a huge difference. Saying animal products will be a thing of the past for the next generation may sound like an interesting, even plausible prediction, but in reality, it is merely speculation. However, what isn’t so unrealistic is the idea that meat consumption in the developed world could be cut substantially in the coming years, facilitating a reduction in emissions and an improvement in human health and natural biodiversity.